The works by Imam Harith al-Muhasibi (ra), the teacher of Shaykh Junaid al-Baghdadi (ra), are considered to be amongst the earliest treatises on Tasawwuf. Imam al-Muhasibi (ra) was born in Basra during 2nd century Hijri. The renowned research & Hadith scholar Shaykh Abdul Fattah Abu Ghuddah (ra) did the tahqeeq and takhrij of the treatise Risalat al-Mustarshideen which is attached above. A fascinating book on the praise of the Prophet (upon him blessings and peace) based on a study of the poetry of two of the last century’s greatest writers, the Arabic poet Ahmad Shawqi and the Urdu poet Muhammad Iqbal. Ever since I saw this book on a side table at Shaykh Omar Qureshi’s house, I was dying to find a copy for myself. I am overjoyed to have been able to find a pdf of the book, although I am still looking out for a seller of a hard copy. Enjoy. One of the most enjoyable books I have read that discusses the virtues of each month and the good actions specific to each. A perfect book for khatibs and imams. This edition does include useful notes but unfortunately does not have a complete takhrij. Over the past two years, Madania Publications has revamped their publishing by making the change to publish books with better material quality and style (glossy cover, better print, proper margins, less misprints, attractive cover images, etc.). This is very well appreciated as Islamic literature in the English language, usually translated works, often lacks the aesthetic quality which western readers are acquainted with. Therefore, readers make the mistake of dismissing the book simply due to the publication’s poor material quality and style. As a consequence, they are deprived of the academic and spiritual treasures of past and present scholars. Madania Publications’ latest release is the well-known treatise of Shaykh Muhammad Zakariyya al-Kandhlawi (ra) entitled The Inseparability Of Shari’a & Tariqa. Readers may be acquainted with a previous English translation and publication of this work by Darul Ishaat. What is the relationship between Shari’a and Tariqa? What is taqlid and does it still hold relevant in our time? 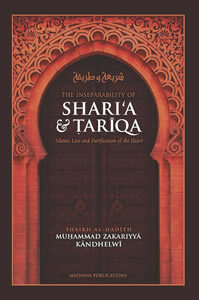 Shari’a & Tariqa is an essential book for anyone wishing to understand the foundations and application of Islamic law and the relationship that purification of the heart has with traditional Islamic jurisprudence. The esteemed author, in this last and final work [of his], draws evidence from the Quran, Sunna, pious predecessors, past and recent scholars, history, and rationale to clarify the confusion many have when searching for a true scholar of Islam. This book explains how many of the controversies and sectarianism within the Ummah today are born out of ignorance of both Shari’a and Tariqa.